Digital Foundry – specializing in “game technology and hardware reviews, using bespoke capture and analysis tools to provide a unique look at the way games play.” – released a video on the remarkable achievement of playing Xbox 360 games on the Xbox One. Even more impressive is the ability to upscale 360-gen games to 4K on the Xbox One X! Well, Microsoft has created “an Xbox 360 VGPU” that works on the Xbox One’s X86 platform. The 360 and its games ran on IBM’s Power PC architecture. The original 360 game code is then “reversed engineered into an intermediate and then compiled into X86”. It’s complex obviously, but the it amounts to the Xbox One working as an emulator while the original software acts as if it’s running on a 360. As the game runs, constant checks to the emulation are happening, which allows for even better performance than the original, resulting in higher frame rates and the ability to upscale visuals. When DF first tested the 360 backwards compatibility system, and found terrible performances of a few titles, most notably Halo: Reach. Microsoft even remarked that DF’s videos influenced their emulation department to use similar techniques, comparing the games side-by-side with constant FPS counters and more in-depth tools. Digital Foundry noted that Microsoft has a team of over 100 working on emulation. Microsoft has invested serious resources into back-compat, as every compatible game has now been revised twice for improvements when emulated. To get the vanilla versions of the 360 games up to 4K is a fascinating process. The extra power of the X can increase the resolution of 360 games by 9x, this scales 720p to 4K. A Microsoft developer devised a method that leaves the original game code unchanged while the emulating GPU scales up every render target and swaps in the new higher-res textures. Microsoft describes their department as ‘craftsmen’, ‘tuning each game at the emulator level’. 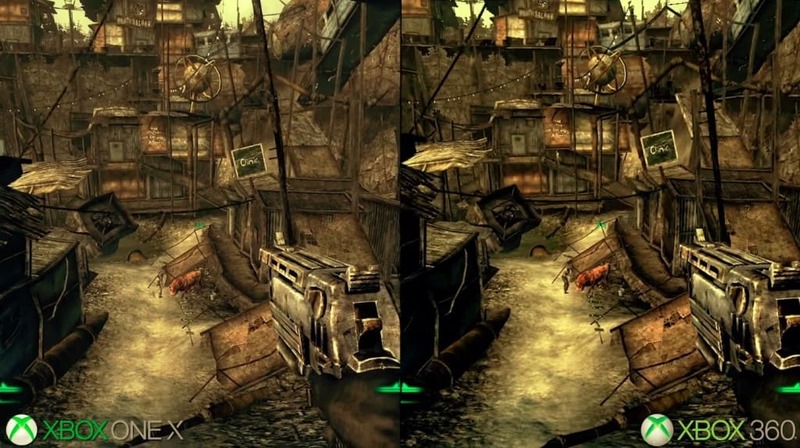 DF shows beautiful results from Fallout 3 and others. Microsoft’s solution for backwards compatibility is incredibly generous. While Sony charges a high amount per month to stream their back catalog (and now PS4 games) Microsoft gives free access to upgraded versions of 360 games provided you own the original. They receive zero dollars directly and take a hit for the 100 person team they have working full-time on emulation. Of course, the long-term business model will see copies of 360 games being purchased and the prospect that anyone with a large 360 library will be tempted to buy the next-gen console that not only supports their existing games, but enhances them. You can check out the rest of the video for more details here.